If you have done any research into art curriculum in the homeschool community, you know that ARTistic Pursuits consistently ranks among the best. As you can probably imagine, I was excited that we were blessed to do another review for them! This year we are now working through Early Elementary K-3 Book 2: Stories of Artists and their Art by Brenda Ellis. 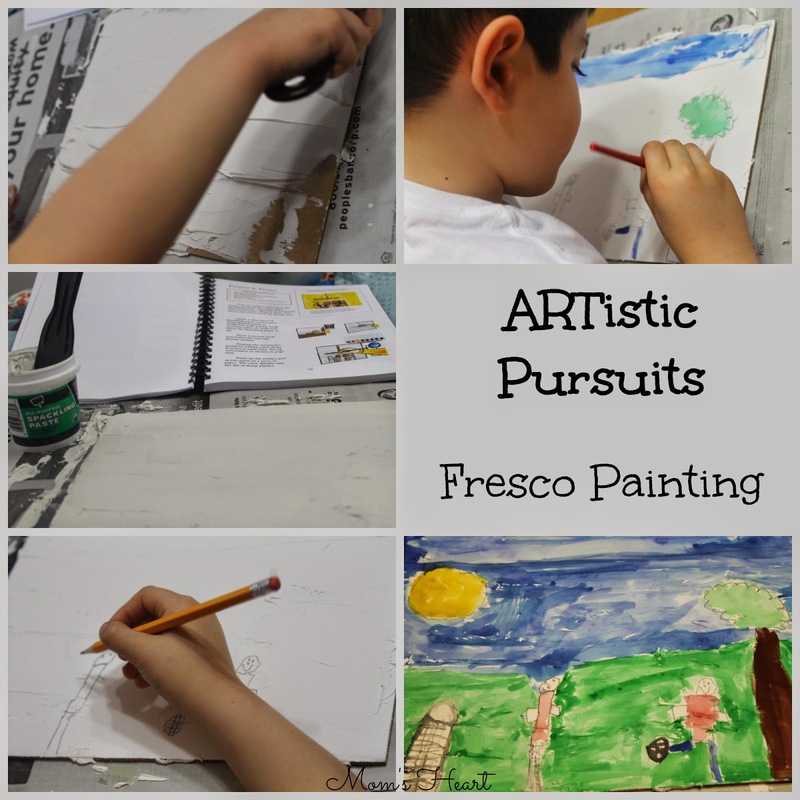 ARTistic Pursuits is a homeschool art curriculum for Preschool to High School, that covers art history, art appreciation, and art techniques, and encourages student creativity using a variety of materials. It is a gentle introduction into all areas of fine arts in one book! Brenda Ellis has made it easy for the artistic and the not-so-artistic (ahem) to teach and enjoy art with their children. Last year we reviewed Book 1 and we loved it, so I was excited to start Early Elementary K-3 Book 2: Stories of Artists and their Art with my 7 year old. My 4 year old was not always interested in participating, he still likes "to do his own thing" with art and that is perfectly acceptable! Although Book 2 is a continuation of the first book, it stands alone and can be used independently. There are 36 lessons that help children make connections between artists and their own lives, and will also help my kiddo produce 36 complete and unique projects that include drawings, paintings and prints! I love having such a well-rounded art curriculum that covers all facets of art education, and you know what else? It's always exciting to open a giant box of FUN school supplies! You can order supplies directly from ARTistic Pursuits, but they also give suggestions for procuring them in other ways. Brenda Ellis does suggest specific brands for some materials, to ensure higher quality results, but they aren't necessarily "expensive" brands, so you needn't worry about blowing your budget on art supplies. I also appreciate that the curriculum uses unique materials, like spackling paste; things I might not have thought to hand over to my child in the name of art. It has helped open my eyes to how much art is really around me. In the beginning of the book, there is also a suggestion for how to group the supplies so that you can easily grab what you need for individual lessons. Some lessons also give a brief tutorial for how to set up your supplies or properly use materials. Showing the little ones how not to use a paintbrush via the picture in the book is easier than trying to explain the right way to do it. I teach this age group in co-op, so ask me how I know! The lessons cover not just how to use the materials, but art history, important periods in history and famous works of art. They generally start with a short reading about the artist to help us understand their background and their artwork. Then there is often an opportunity to examine a piece of their art, but there are questions already printed in the book in case you need a little more hand-holding for picture studies. Lastly, there is the project, where the student gets to create! This is Elliott working on a "gold leaf" painting, of a King. We used yellow origami paper for the gold, as suggested. Of course, had I looked further, I could have found the gold colored origami paper in our package, but it is what it is, and he enjoyed the process! Often a few lessons will build upon each other and are connected, but they are not repetitive. For instance, in Lesson 3 we read a short "story" about Giotto as a child, and learned a little about scratch art and frescos. Then we created our own Scratch Art with oil pastels. In Lesson 4 we learned about typical Gothic art, examined Lamentation of Christ by Giotto to learn what made his art different. Our project was a Fresco painting with spackling paste and watercolors! We learned that artists prior to Giotto painted stiff, expressionless people, but Giotto was known for painting people in movement and full of emotion. The assignment was to create a fresco scene that shows people with emotion. He chose to paint a happy game of soccer. This curriculum offers everything you need for an art course. It is comprehensive, yet easy for the someone not as confident in art to follow along and teach. Other than gathering supplies, there is no prepping ahead to plan lessons, because everything is written out for you right in the book! I think it gives a good overview of chronological art history, with a nice mixture of projects to keep students interested and engaged. Even though the book is geared for K-3rd, I think it is easily adaptable. Some mature Pre-K students may be able to participate on their level, and older students who haven't had many formal lessons or art history will gain a lot from this curriculum. It can certainly be used with several children of different ages and abilities at one time, whether in a family setting, co-op or art class. I also wouldn't limit it to homeschoolers. I could see this working well for families who want to add more fine arts than traditional schools include, or for the artistic child who just craves more. I also love that it is non-consumable, so the $47.95 retail price averages out well in the long run. It's a very user-friendly art program, and we really enjoy it! 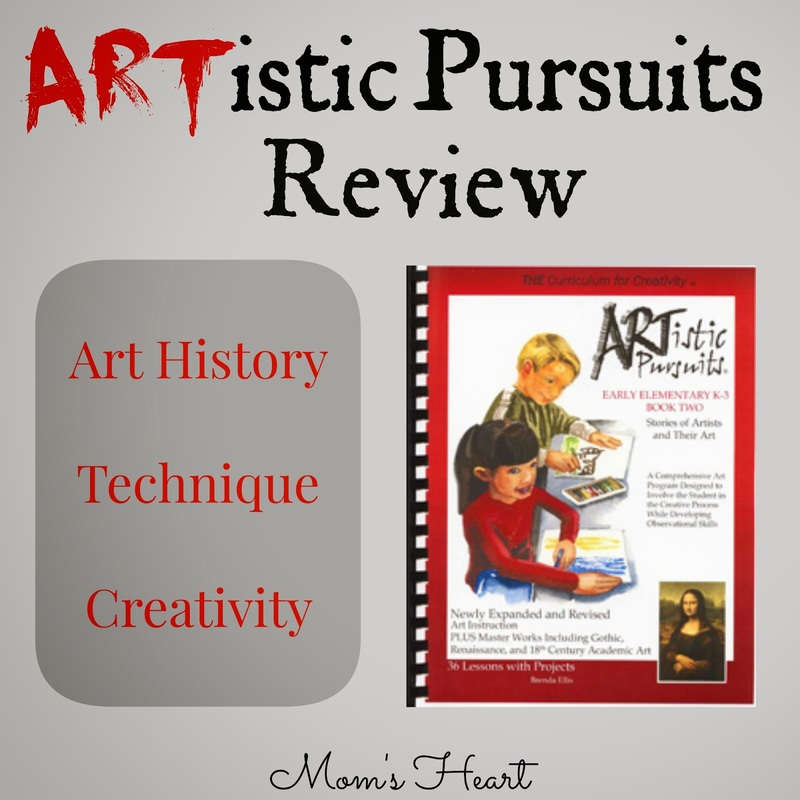 The crew reviewed several different ARTistic Pursuits books including preschool, elementary and middle/high school levels, so be sure to check out more reviews or find Artistic Pursuits on Facebook! Yes, I definitely think these are appropriate for older students as well! They are very informative and interesting.